The river was getting too narrow for comfort. Vraska looked over the edge and saw the riverbed less than a body length below. Two massive rocks stood like gate pillars on either side of the water ahead. Their ship would fit, but just barely. She eased off the left oar and began steering toward the riverbank. Jace had given up on maintaining their invisibility several hours back. As night fell, glowing insects and other, stranger lights that Vraska could not identify lit the jungle anew. The banks on either side were too steep to bring the boat ashore. Were it not for the massive dinosaurs that undoubtedly lurked in the woods, she would have found the atmosphere quite lovely. "We'll sleep in the boat," Vraska said. She let go of the oars and hissed as she poked at one of her blisters. The thaumatic compass sat on the plank between the two Planeswalkers. Jace picked it up and looked where it was pointing. "That thing would be more useful if it told us how far we had to go," said Vraska as she stretched one arm out, then the other. She laced her fingers together and sighed with relief. He looked up, and the magic in his eyes lit up the contours of his face. A large draft horse materialized above them, glowing a delicate blue against the night sky, and ran upward into the canopy. The spectral horse would serve as a beacon for Malcolm. I hope the rest of the crew arrives soon. The air was thick and windless. It smelled of growing things. Sap, rot, things dying and eating and growing on top of all the other dying and eating things. Vraska remembered her crew would sing on windless nights like these when they were trapped at sea. She loved those communal moments most. She and her tribe, enemies of all but each other. "A castle grows in Old Below," she sang. Jace looked at her like she had grown a second head. Vraska smiled and finished the verse. Some wander its maze, a mess of decay—"
Vraska paused. Jace was listening carefully. "You want me to keep going?" she asked with a tired smile. Jace smiled. She sat up and kept her voice down. Perhaps music would deter whatever dinosaurs might be listening. ". . . and the Kingdom of Rot will rise one day." Jace made a tired little noise of approval. "Cheery song." "The Golgari have little to be cheery about." Vraska sat back with her eyes closed. Jace's voice was slow with sleep. "Breeches taught me a song." "It's a rude song. Very rude. He's a rude little goblin." Jace went quiet after that, and a moment later he was lost to sleep. Vraska wondered if he could do that on command. Small winged creatures chirped overhead, and night birds sang deep in the jungle. She opened a golden eye and gazed back at Jace. At the second-most-dangerous telepath in the Multiverse. He could break my mind as easily as I can sing a song. And yet . . . he would not. He would never. Not when he listened like he had (like no one had). Vraska knew in that moment that, memory or no, this was a man she could trust—and one who would trust her in return. She did not need another person to be complete, nor did she need validation of who she was. And if he weren't interested, that was fine—she had a history book at home to finish. But if he were interested, Vraska imagined he would make her tea if she was upset. He would listen when she needed to be heard, cheer her on to her own victories. All in all, not a bad prospect. Perhaps she'd ask him on a date when all this was over. She hadn't been on one of those in a while. For now, though, Vraska was happy as things were. A simple, straightforward race with a good friend at her side—that was what she needed. Vraska couldn't wait to petrify whoever had stolen his memories. 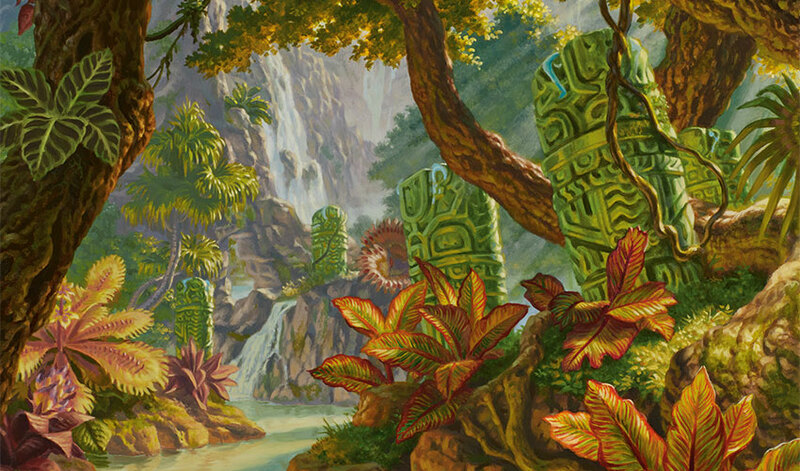 The glow of the plants around and the stars above made their cold little boat feel warm in the shadow of the jungle, and as Vraska closed her eyes, she felt the cool breeze of invisibility cover her once more. Jace slept soundly after his watch. The quiet and the open air were welcome changes from the months he had spent sleeping in a hammock surrounded by the rest of the crew. Vraska and Jace abandoned their boat the next morning. They rowed to the shore and left the ship on the riverbanks. Masses of rock and forest floor seemed to jut out at odd angles, and any semblance of a path was lost in the noise and chaos of the jungle in daylight. Vraska got out her sword as a makeshift machete to clear the way. Eventually, the two came to a wide, clear path. Vraska put her sword away in relief. "About time. Sword blisters fall in about the same place as oar blisters," she groaned. Jace's brows furrowed. "We may not want to walk here." He pointed up at how the clearing ran through the canopy. "This path was probably made by dinosaurs." Vraska sighed. "So all of this path was worn by dinosaurs crossing it?" "No, it was cut by dinosaur loggers," Jace explained further in perfect, sarcasm-less deadpan. Vraska snorted a laugh. Jace shook his head gravely. "Don't insult the noble trade of dinosaur forestry." Vraska's laugh was interrupted by an odd smell in the air. A thick cloud of dark smoke suddenly flooded the grove around them. The smoke was cloying, an inky mist with the vague scent of myrrh that enveloped the trees, obscuring what little light broke through the canopy above and turning day suddenly into night. Jace shouted in surprise, then reached out to sense what he could with his mind. Vraska was standing in the center of the path, grappling with a barely-visible foe. The mist was too thick for vision—he reached out to the enemy's mind, sensed the spell that was casting the darkness, and pinched it off. The dark smoke dissipated, leaving a conquistador standing exposed. The vampire was snarling, chin covered in crusted blood, and her gold and black armor shone. The sigil of a rose was embossed on her chest plate, and the points of her helmet loomed jagged and sharp over the gorgon. The crust of dried salt on her armor led Jace to believe this was one of the survivors of the other shipwreck. Jace held up a hand and created the illusion of a massive, disorienting storm. Thick rain poured from the canopy above, the vibrant green of the path turned dark, and a clap of thunder sounded overhead. Vraska appeared unfazed, but the vampire was startled. She jumped, slightly, but came to just in time to block a strike from Vraska's sword with her armored shoulder. The vampire left her sword sheathed, moved in close, and attacked in a frenzy of kicks and blows. Vraska tried to swing her sword in response, but was interrupted by a sharp jab to her jaw. She began to draw the magic necessary to petrify the vampire. Jace again threw out his hand, reaching for the vampire's mind, but the chaos of the tussle was too much—he was too unpracticed—and a gauntlet landed a blow to his forehead. He fell back to the ground, concentration shattered. The illusory rainstorm vanished, and the dappled sunlight flickered back into view. 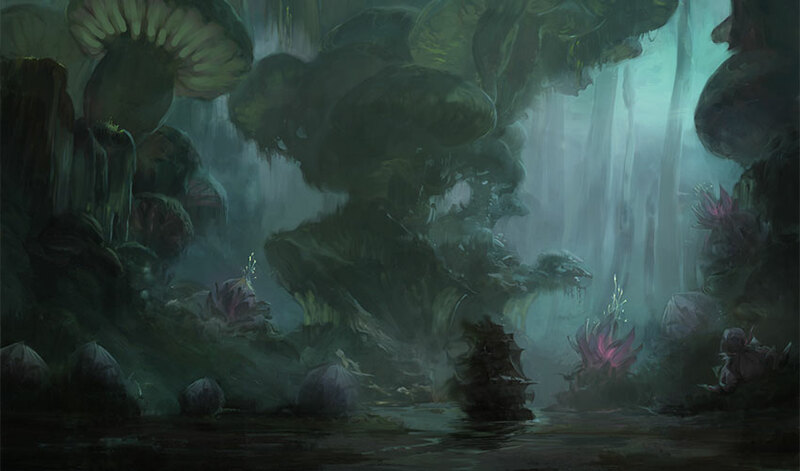 Jace groggily watched as the vampire reached down to the forest floor and felt around, snagging the thaumatic compass from the ground at Jace's feet, and ran into the thick of the jungle. Vraska swore and struggled to her feet, a hand over her own eyes and hissing in pain. She blinked away her own magic and growled in frustration. Jace shut his eyes and concentrated. He opened his eyes and looked up, sending another massive horse charging into the air as a beacon for the crew. Vraska was still fuming. "That damn vampire must have learned what I did to that other captain. We shouldn't have left the crew alive." Jace sighed. "Objectively, you're not wrong." Vraska kicked the tree again. "I can find her, and we can retrieve it. And then you can kick all the trees you want." Jace said with determination. The gorgon took a deep breath, took a moment, and nodded. She looked at Jace with a slight crease between her brows. "Are you sure you can track her?" Jace closed his eyes and concentrated. He listened for the vampire's mind. What he heard instead was a pair of furious internal monologues. Tishana is too far ahead, how does that elemental move so quickly? Urge left, dodge vine, there—up ahead—Brazen Coalition man standing back to us—is that the green-skinned pirate?! His eyes snapped open in surprise, and in one fluid motion, Jace whipped around with his arms crossed in front of him. An immense, illusory, flying snake crashed into his arms and split on either side of Jace's psychic defense. The source of the illusion was a merfolk standing precariously on the back of a massive elemental. He looked to the source of the other mental voice, a woman wearing steel armor plated with the same feather pattern as the dinosaur she rode. A half-circle blade hung at her side, and her long braid flicked in the air as she barreled toward him. Jace's thought process leapt from idea to conclusion. He held up a hand at the oncoming human, a tingle ran down his neck, and the woman pulled back sharply on her dinosaur's reins. The beast skid to a halt. The woman atop it looked frantically to either side. The merfolk's fins fluttered. "It is an illusion!" She held out a hand, and vines whipped up from the forest floor to wrap themselves around Jace's legs. He fell to the ground in a heap, and the invisibility he had projected vanished. Vraska stepped out and stood in front of him. She called out to the knight and merfolk. "Wait!" "Why are you chasing us?" she asked. Jace gave himself permission to sweep the surface of the merfolk's mind. "The merfolk knows about the compass." The merfolk's fins fanned in surprise and anger. Vraska's lip curled. "Who are you?" Jace stood, and the vines around his feet receded. He took a place by Vraska's side and stared down their opponents. Tishana's elemental readied itself to attack. The merfolk laid a reassuring hand on its side. "My name is Tishana, an elder of the River Heralds and protector of Orazca. One of our own heard a fruitful rumor about you, pirate." Jace silently berated himself. That merfolk in the corner at High and Dry had overheard their conversation after all. The knight next to the merfolk straightened her shoulders. "I am Huatli of the Sun Empire, Warrior Poet and vanquisher of interlopers." Jace couldn't help but notice Huatli's eye twitch at the words "warrior poet." Tishana glared at Vraska. "None may possess the city or what lies within it. Hand over the compass or die where you stand." "If you insist," Vraska purred, her eyes beginning to shine with magical intent. Jace held out a hand to block her gaze. "We don't have it," he blurted. Vraska huffed a noise of frustration and gently moved his hand away from her eyes. She crossed her arms in impatience. The merfolk must have heard him, but her face did not betray her thoughts. Instead, she tilted her head to one side as if she were listening. Curious, Jace dipped back into the surface of the merfolk's mind. Through some unseen connection she was sensing an intruder move through the jungle ahead. Her tether to the trees and soil underfoot was delicate, and every step of the intruder left a trail through the rainforest. Experiencing it first-hand was elating—Jace had not known that such power was possible. The merfolk looked to Jace. "A vampire is near. Did she take the device from you and abscond?" The knight on top of the dinosaur had a subtle amber haze about her, and her dinosaur rumbled a deep growl. Jace began to hear the movement of other dinosaurs around them. He centered his weight and balled his fists. "The vampire took the compass from us." Something snapped its jaws in the jungle behind them. Both Vraska and Jace jumped from the noise. The knight smiled and turned her dinosaur to the side. She flashed a winning smile. "Thank you for your cooperation." 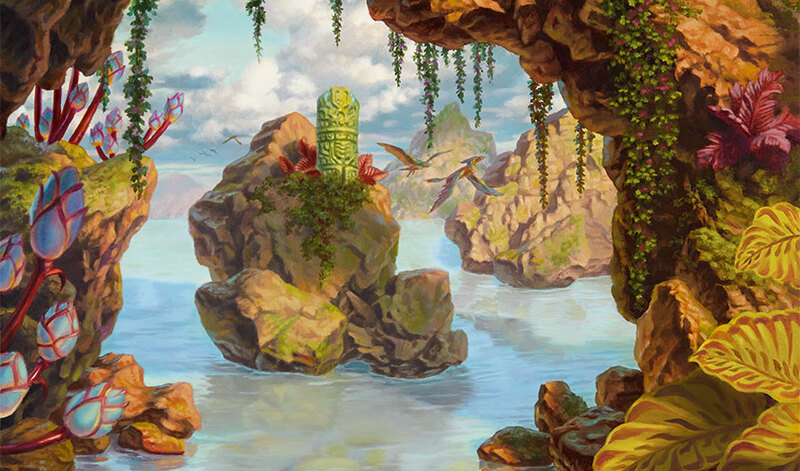 The merfolk swiftly climbed atop her elemental, and the two women bounded into the jungle. As soon as they left, Vraska snapped her head to Jace. "Can you track the vampire?" Jace nodded, listened briefly for the vampire's mind. "I can track more than just that." Vraska nodded, and the two of them took off into the thick of the forest. As Jace ran, he sent another signal to the rest of their crew—and the illusory draft horse charged along the same path as its caster below. 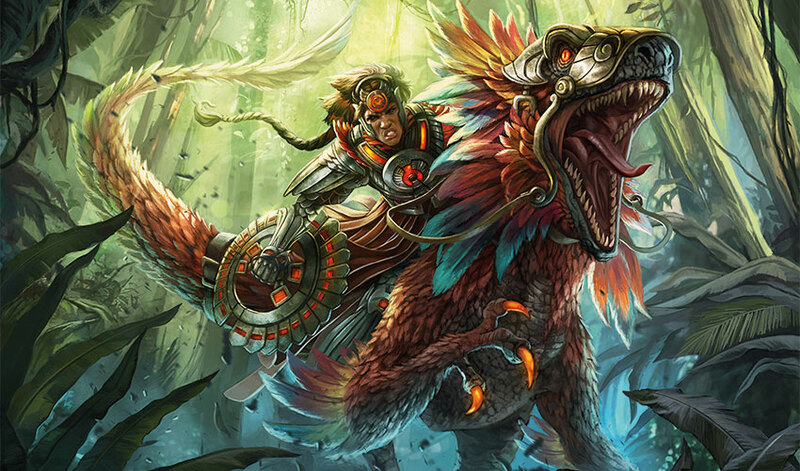 Huatli placed a hand on her mount as they ran and sent a short charge of magic through their connection. A dinosaur perceives through scent what a human sees with their eyes, and years of training had taught Huatli how best to communicate with her mount. The dinosaur sniffed the air, lowered her head for the hunt, and increased her speed. Leaves whipped past, and Huatli allowed her eyes to adjust as the branches above began to give way to wider trees with a thinner canopy. Smaller creatures dodged as she passed, and Huatli could hear birds and dinosaurs in the canopy above screeching warnings to each other as she and her predator moved below. "This may take some time," Huatli said. They passed down steep hillsides and through empty vales, and at one point, they waded their mounts through the shallows of a lake. Every time they got close, the vampire would pull farther ahead, and every time they stopped for breath, they marveled at the tenacity of their foe. "She's fast for a dead woman, isn't she?" 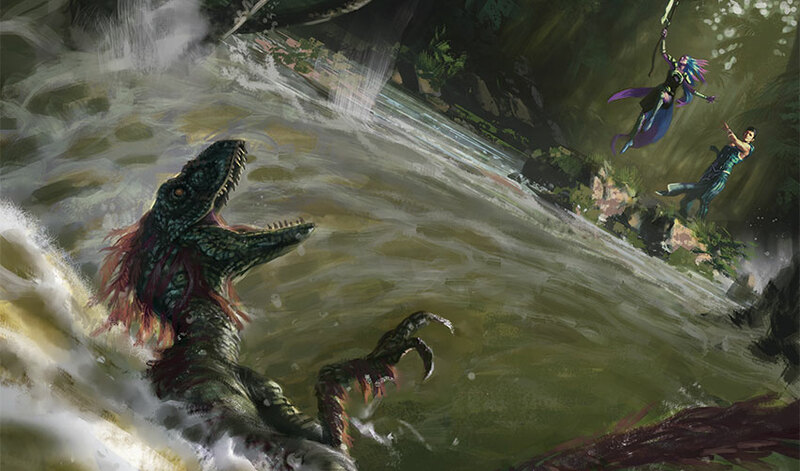 Huatli panted, massaging a cramp in her thigh while her dinosaur drank thirstily from the lake. Tishana seemed unimpressed. "The intricacies of the universe care not for how quickly the tapestry is made, only the ultimate connecting of its fibers." For the sixth time that day, Huatli rolled her eyes. The merfolk and the knight eventually emerged on the other side of the lake. Huatli felt the dinosaur's glee—their prey was almost within reach. Sure enough, she soon saw a gold-clad figure ahead, leaning against a tree and panting with exhaustion. "Let me have her, Tishana!" Huatli yelled. The merfolk slowed her elemental's jog and held back. The dinosaur drew itself closer to the ground for the attack as they approached. The vampire turned her head to see what was approaching, but she didn't have time to respond as the dinosaur opened its jaws and seized her around the waist. The vampire screamed in surprise as Huatli's dinosaur tossed her aside into the trunk of a massive tree. Huatli dismounted and walked toward the vampire. Her foe was taller than she, and an angry streak of blood stained her collar. What lace poked out from her armor was damp with perspiration, and she had the look of a child who refused to wear anything other than their favorite outfit, no matter how inconvenient it may be. "What you lack in blood you make up for in sweat," Huatli said, landing a kick square in the vampire's chest. The vampire stumbled back into the tree with a breathless grunt. She panted and pulled at the collar of her armor. Huatli grinned. "What, were there no jungles in Torrezon? Are you uncomfortable?" Her eyes lit with an amber glow, and her dinosaur rumbled a low growl. Seize, Huatli instructed. The dinosaur jolted forward and grabbed the vampire once more with her jaws. The bite was not hard enough to pierce the armor, but it was sufficient to hoist the vampire off the ground. The vampire was flailing in protest, trying to draw her sword while batting and clawing at the dinosaur's thick hide. The dinosaur shook the vampire up and down, and the conquistador wailed in response. An odd-looking compass flung out of her pocket and hit the ground. Huatli kneeled over and picked it up. It was beautiful and elaborate, humming with an energy she could feel through the palm of her hand. The vampire, drenched in spit, hit the ground with a slimy thud. Huatli sensed for the nearest meat-eating predator and summoned it with a burst of magic and an invitation—Feast! She felt as the raptor bounded toward her in the jungle. Huatli quickly climbed up on her saddle, and her mount took off into the jungle. The greatest warriors of the Sun Empire never killed, but they would never let a hungry beast go without a meal. Huatli trotted toward Tishana with a grin on her face. "Run, before the vampire can catch up! I got the compass!" The merfolk smiled in response. Her teeth were like little knives in a well-organized row. "Wonderful!" Tishana took the compass and looked it over, turning it over in her hands and investigating it as carefully as one would a sacred text. She narrowed her eyes at the object, then gave Huatli a sly look. The compass began to emit a pulsing amber light straight ahead. The fins on the side of Tishana's face fluttered, and she closed her eyes. Huatli closed her mouth and waited. She knew the River Herald was sensing something she couldn't see. After a moment, the merfolk's eyes fluttered open with an astonished wonder. "The end of our peregrination is near." Huatli was too excited to roll her eyes this time. "Really?" "It is part of the land around it, yet separate, to keep it hidden. It does not move, but the way to it is enchanted to change . . ." Tishana closed her eyes again and pointed. Her finger was parallel to the line of the compass. "It is a half day's travel that way." Huatli nodded resolutely. "Then we must not wait!" Her mount shifted ever so slightly away from Huatli. Her eyes darted to the compass. Huatli's mood turned defensive. "Tishana, we had a deal we would go together." "Yes," said the merfolk, "we did." Huatli lunged for the compass, but just as she grabbed it she was interrupted by the slap of a large flap of canvas covering her face and knocking her off her mount. Huatli hit the ground, her body entirely wrapped up in a massive sheet of cloth. She tried to wiggle her way free, but the canvas around her grew tighter. Beyond the fabric, she could hear her dinosaur screech and cry before being suddenly silenced. The silence was broken by the cheers of about a dozen people. A familiar female voice laughed. "Let her out, Amelia." The fabric lifted Huatli back to her feet and spun her around until she was free, stumbling with dizziness from the release. A pirate helmsmage stood with her hands at the ready, and the canvas—did she drag that sail all the way from the beach?—bound itself around Huatli's hands. Huatli gasped. Her clawfoot was in front of her, crouching for an attack, jaws wide open . . . and entirely encased in stone. The green-skinned pirate from before ran her hand along the side of the newly petrified statue. She knelt to Huatli's level and smiled. "I'll be taking that compass back now." The tendrils and vines of the woman's hair writhed in smug pleasure. She took the dropped compass from Huatli's feet. "How did you catch up to us?!" Huatli spat. The green woman tutted and shook her head. "The vampire you were tracking followed the compass in a straight line. Across this terrain I find that is not terribly effective. It's much easier to find shortcuts with an eye in the sky and a telepath on the ground." The siren behind her preened, and the man in blue very politely bowed his head with a smile. "Any other questions?" asked the captain. Huatli concentrated her fury and channeled as much energy as she could into a spell. Her eyes lit with an amber glow, and from behind her a herd of clawfoots screeched in the jungle. She would never be without a mount in these jungles. As the dinosaurs made their way toward her, the pirates fled in the other direction. Huatli wrestled her way out of the ropes and looked for Tishana. Damn merfolk! Where did that traitor go?! Her answer came with a faraway rumble. Huatli didn't want to wait to find out what it was. Behind her she saw Tishana, standing with her arms outstretched, and the trees moaned with bent wood and the smash of water as she summoned a flood to careen through the jungle. Huatli had just enough time to order the dinosaurs away again, and she sighed in relief when Tishana's summoned river rushed past her and toward her fleeing enemies. The pirates screamed and scattered, and Huatli could have sworn she saw the green-skinned woman and the man in blue escape. "You're on your own, Warrior Poet," Tishana said dramatically. "I must stop Kumena on my own." Huatli rolled her eyes once more just as Tishana vanished into the thick of the jungle. Fine! If she wants to break our bond, then that is on her! Huatli let out a colorful curse. She once again began a spell to summon a new mount. She needed to follow the scent of the green-skinned woman. Huatli's merfolk guide may have left, but she was close enough to her goal that she didn't need Tishana any longer. A voice caused her to gasp in surprise. Angrath stood as tall as a tree and as wide as a snubhorn. His head was that of a horned beast, and his body rippled with barely contained power. Red-hot chains were draped over his shoulders, and he huffed in exhaustion. All of this had started when the pirate had attacked her before. All of it came from whatever that pirate did that made her see what she did. Huatli grimaced and ran in the same direction the pirates had fled. "WAIT! I WANT TO TALK TO YOU!" "I DON'T WANT TO HEAR IT!" Huatli yelled back. Huatli looked to her right. Angrath was close behind. She quickened her pace, but a chain whacked and wrapped around her ankle, yanking Huatli to the forest floor. She masked her fear with a brave face, drew up a hand, and began charging a spell to summon as many dinosaurs and beasts as she could. He walked forward and kneeled, laying his chains cold and dark on the forest floor. Huatli's heart was racing. She was more terrified than she ever had been. What was this killer playing at? "You're like me," he said. "I'll never be like you!" Huatli yelled defiantly, dramatically. "No, idiot, not like that," Angrath replied, his eyes stern with impatience. "I will not harm you, fellow Planeswalker." Angrath stood, looking down at her. Huatli was about to demand answers, but Angrath spoke calmly and resolutely. "Whatever prevents us from leaving this plane is locked in that city. We can help each other escape to different worlds if we find it." A small glimmer of wonder burst through Huatli's confusion. Angrath continued, ". . . And all we have to do is kill everyone who tries to steal Orazca from our grasp." Huatli's hope vanished, and a sick malaise filled her gut. Spectacular, she thought to herself, the murder monster wants to be my friend. The thaumatic compass began to vibrate in Vraska's hand. Her heart leapt as she ran, Jace at her side and her crew at her back. The merfolk's flood had been a smart distraction, but the crew of The Belligerent was not so easily washed away. Malcolm flew up and ahead and returned with a gasp. "It's on the hills ahead!" "Keep running!" Vraska yelled to her crew. They were so close, so incredibly close. 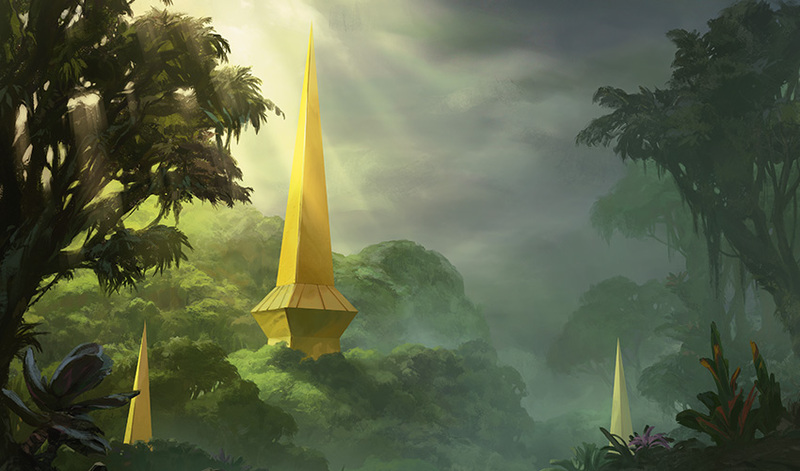 The trees grew differently in this part of Ixalan. 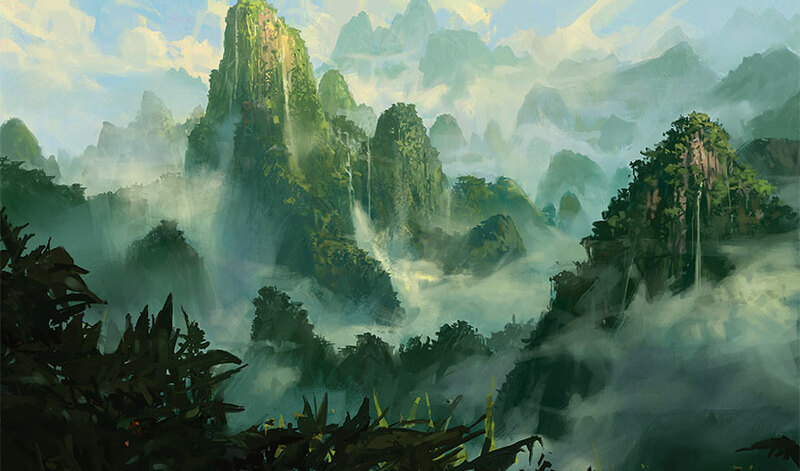 Vraska and her crew had passed through a mountain range and ran now through a maze of fog and plants. Occasionally, they would run past a tree with beautiful yellow leaves, and in the rocks, beside them, veins of precious gold glittered from under the lichen and moss. The land itself seemed eager to betray the secrets it kept. The crew of The Belligerent came to a clearing, and all of them stopped in their tracks. Shining as golden beacons above the green, the spires of Orazca pierced the sky. The points commanded the horizon. 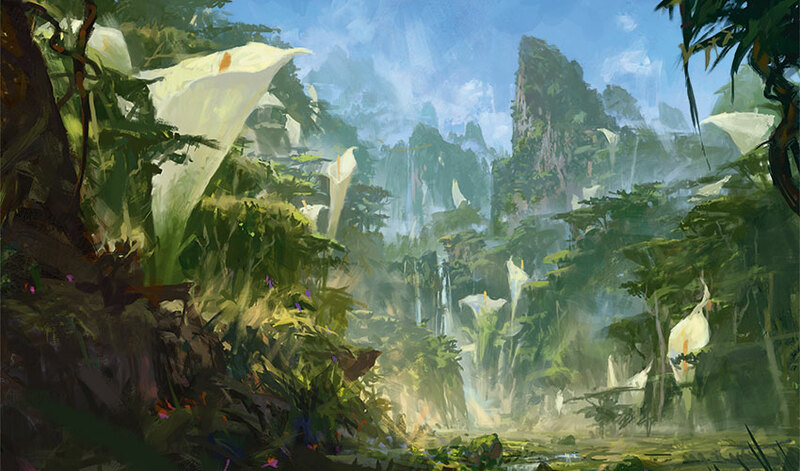 Their masses were hidden beneath an endless barrier of trees, its bulk so immense that Vraska wondered if the hills themselves were the buried city, coated with an impenetrable tangle of jungle. She tucked away the thaumatic compass, which pulsed and glowed to mirror the immensity of magic that surrounded them now. "It is home to more than just the Immortal Sun. Whatever enchantment keeps us here is in there, too," she heard from behind her. Vraska turned. Jace had caught up to her while the rest of the crew took a break before the final leg of their journey. She nodded. "I haven't quite figured out what the Immortal Sun actually does yet. There are too many rumors to raise one theory over another." "It may quite literally be the key to us leaving." "It may," Vraska said. "It may also give eternal life without need for the ingestion of blood. It may make the Sun Empire undefeatable. It may be a wellspring of unimaginable power too precarious for any person to control." "I think it's something that's not supposed to be here," Jace said. "Something introduced to this world." Jace put a hand to his chin in thought. "It might also just be a hunk of rock. And not do anything. Maybe Lord Nicolas is a rock collector?" "I honestly wouldn't put it past him," Vraska shrugged. "He strikes me as a man with weird hobbies." Jace shrugged as Amelia called to him from nearby. He went over to the rest of the crew and began chatting. He looked so different without his hood. Vraska had never seen him without it before she rescued him from the island. She distantly wondered if his hair was as soft as it looked. "Just catching my breath. Assemble the crew." Jace called out to the rest of them and Vraska quickly rearranged her expression into something more commanding. As Vraska approached the crew of The Belligerent, the ground beneath her lurched to one side. Her crew cried out in surprise. Malcolm took to the air, and Breeches crawled up onto Amelia's shoulder. Several crewmates had started looking around frantically for something to hold on to, but there was no escape from the jarring movement. The clearing began to shake more violently, and a long crack appeared in the rock beneath them. "Look!" Amelia was pointing to the spires in the distance. They were beginning to rise, higher and higher, into the air. The city itself was emerging from the jungle with every jostle of the earthquake. Vines snapped, trees were violently ripped from the ground, flocks of sunwings rose into the sky, and more and more of the city came into view. Malcolm landed next to Vraska, a look of panic in his eyes. Vraska grabbed his shoulder. "Did it do this because we approached?" "Someone must have arrived at the city first." He pointed to the thaumatic compass in Vraska's hand. Sure enough, all its points were glowing with a fierceness she had never seen before. The bellow of some giant beast sounded over the shaking of the earth. Vraska froze, the primal noise sending a jolt of terror through her heart. Her dread only intensified when she heard a similar sound of equal volume . . . then another . . . and another. Water began to creep through the clearing, and Vraska looked to the source. A crevasse had opened nearby, and water diverted from the river poured down into the massive, newly-formed canyon at the base of the city. 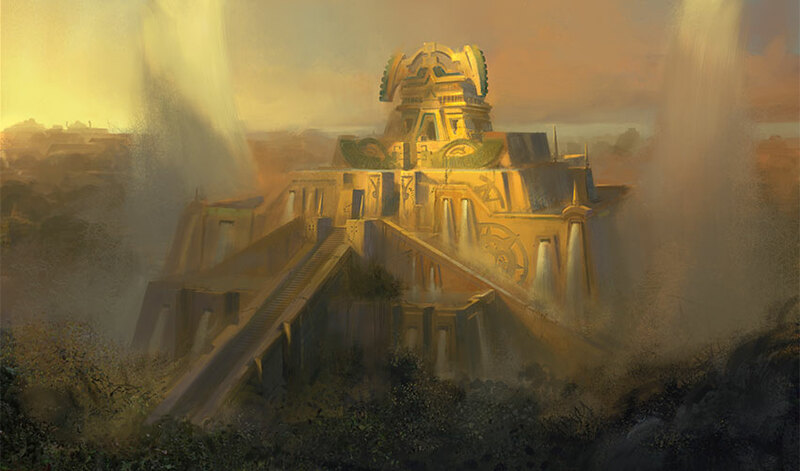 The earth shook beneath Vraska's feet, and the Golden City of Orazca rose further and further from the ground. Now that it was free of centuries of overgrowth, she had a clear view. It was incredible. The city itself had opened like the petals of a flower. True to its name, the structure itself was a perfect, untouched gold, ornamented with turquoise, amber, and jade. Its ramps and walkways led over churning rivers and waterfalls, and high above were strange symbols and motifs carved with care. Vraska was filled with excitement paired with a bold desire to face and conquer whatever it was that had awoken in the distance. She called to the rest of the crew to follow her, but as she began to walk forward, another earthquake took hold and she fell to the ground. She turned her head and gasped. The edge of the clearing they stood at had been cleaved in two, and Jace was clinging to a shifting boulder, trying not to fall over the edge. The other pirates moved aside as water from the nearby river began to eek its way closer. The water increased in volume, and soon a torrent began threatening to wash away what remained of the ledge. 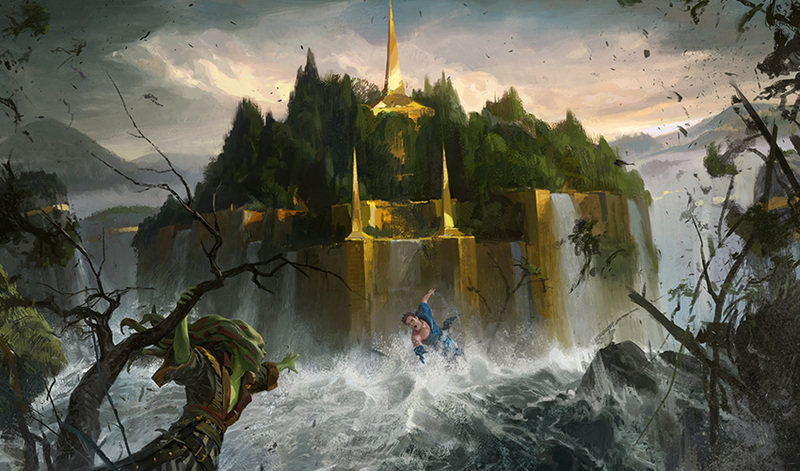 Vraska waded into the river as far as she could, then swam with the current toward Jace's position. She spat out river water and reached for his outstretched hand. As soon as her fingers grazed his, the ground jerked sideways once more, and Jace lost his grip. Vraska watched as Jace tumbled down the side, eyes wide with terror and hands outstretched in desperation. Vraska screamed in fury and grief, for she could not see the bottom of the waterfall. She lurched forward to try and spot his descent, and the boulder underneath her gave way. Vraska fell, mist stinging her arms as she flailed, her hands desperately searching for a grip. She didn't have time to scream—only enough time to rearrange her body so her feet hit the surface of the water first. Vraska was swallowed up by the pool at the bottom. She grasped and grabbed at the water around, trying to pull her way to the surface. Churning water squeezed her sides, and the slamming of the waterfall dared to push her further under, but Vraska did not die so easily. Not when the object of her quest was so close. She felt her fingers break the surface and kicked herself upward, desperate for air. She emerged, sucking in air and spitting out river water. Her feet stung through her shoes with the impact, and she could sense a bruise starting to form on her legs as she kicked. Vast walls of stone and gold had burst through the earth on either side of the water, and the risen city of Orazca towered high overhead. Suddenly, a searing stabbing slicing pain through her temples—she cried out—and an image appeared in her mind with a flash. The image vanished and Vraska gasped in surprise and pain. Panic flooded her veins once more and she desperately kicked toward shore, craning her neck to get her bearings as she swam. 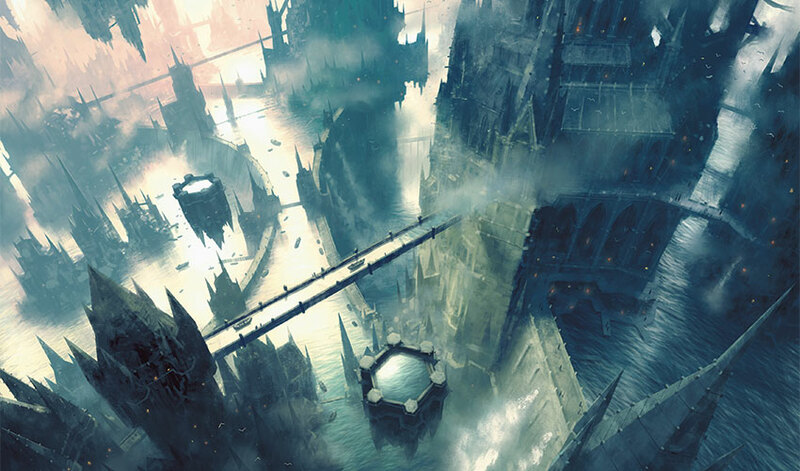 Vraska was still in Ixalan, but the image in her mind was of Ravnica. She was alarmed and confused, desperately paddling her way to where the brand-new river met the newly exposed stone of the city. Vraska spotted Jace. He was clinging to a rock near the riverbank, blood gushing from a wound in his head and his eyes alight with magic. His face was flush with confusion and pain, a faraway look in his eyes. Did he see it too—?! "Jace!" she howled, swimming closer, pulling herself and her heavy soggy clothes through the murky water, paddling to stay out of the swift current brought by the waterfall. "Jace, your head—AHH!" She wore a blue cloak and hood, and lay on the central dais of the Forum of Azor. 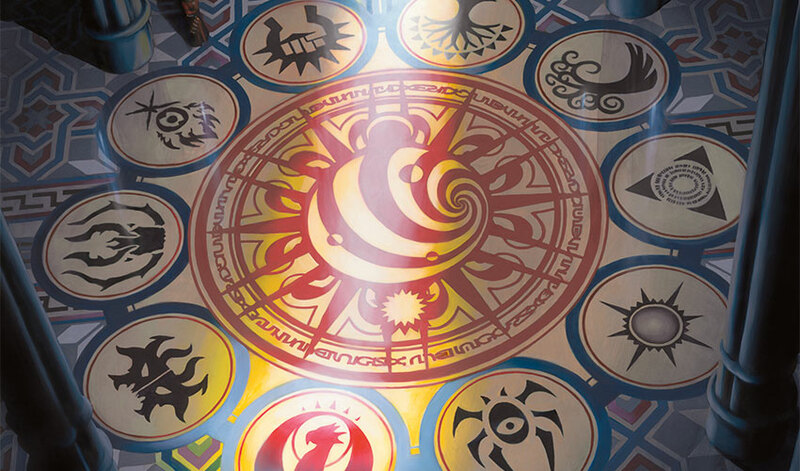 Niv-Mizzet, the parun of the Izzet, was looking down at her, and she could make out the faces of the maze-runners from every guild of Ravnica. This is a memory, Vraska realized. The memory was colored with meaning, belonging, responsibility. It was the day Jace became the Living Guildpact. Suddenly, the image dissipated, vanished, and Vraska was swimming in the river once again. He is remembering everything, Vraska realized with dread. Jace's memory was returning all at once, returning as a flood and spilling over the sides, and he would soon remember everything about what Vraska was. He would soon remember their grudge, remember her guild, remember his job, and then none of what had happened over the last few months would matter. He would remember he was the Guildpact and she was an assassin and their friendship would certainly dissolve. Vraska choked on river water as she frantically swam toward Jace on the shore. He was bleeding, broken, eyes alight and lost in the agony of remembering. It's over, Vraska lamented with a heavy heart as she waded through the shallows toward the mind mage. A pang of headache warned her another memory was about to flood her perception, and she shut her eyes tight to brace herself as Jace's past slipped through his control and rammed into her mind.